It ran from the arctic to the equator, spanning several continents. In spite of this, the design stayed constant for its entire length. You'd almost think it was the same section of pipeline, surrounded by different scenery. 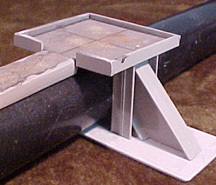 The basis of the model is a 4' section of 1.5" PVC pipe, normally used to ship posters. There is a centre island with an access hatch, and ladders on either side. 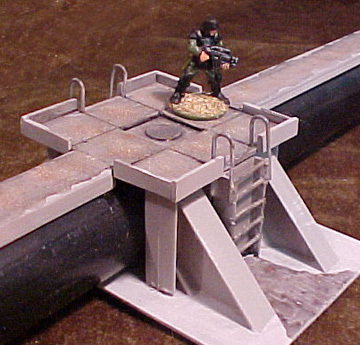 Patrol walkways extend 6" from this, to smaller platforms. 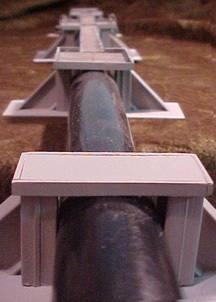 Farther along are simple supports, representing the majority of supports along the length of the pipeline. To make the supports, I used heavy, I-beam shaped plastic cut from some extruded plastic signs. 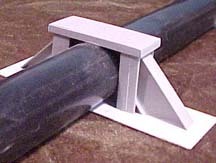 I first cut two uprights and glued them to a base on either side of a section of pipe. I then cut two 45-degree braces from the same I-beams, and glued them into place. Finally I added a top cap and edge cut from styrene. The edge finishes & strengthens the top cap, and gives it a heavier, stronger look. For the centre island, I placed two support sections side-by-side with a 60mm square platform on top. The ladders are two sections of I-beam with notches cut into one side. I glued wire into the notches, and added wire handrails on the top. The walkways are (you guessed it) sections of I-beam with the extrusions removed from one side. In use, I usually surround the pipeline with moss & lichen, but different bushes and grasses will help to establish particular settings fior the game. This piece was designed for a particular game, precisely because it divided the table in two. It blocks movement, fire, and line-of-sight, making anyone climbing over it an easy target to everyone in range. It made for some interesting tactical decisions.